The continuous sophistication within MP3 players market has taken listening of music to another level. Since the introduction of iPod by Apple in 2001, there has been an increase in the use portable media players. Even the adoption of smartphones has not led to significant decrease in the use of MP3 Players. Today, there are varieties of MP3 players with better quality that any smartphone can match. How to Choose MP3 Player? The challenge of choosing the best MP3 player doesn’t arise because of lack of quality products in the market but mainly due to a wide variety of MP3 players available today. However, it doesn’t have to be a daunting task. Choosing your MP3 player only boils down to four things: storage capacity, price, resolution and file format support. There are other minor considerations such as the interface, battery life, and compatibility with other devices.Unlike smartphones, most of the MP3 in the market can hold thousands of songs and a host of videos and apps without compromising on audio quality. There are some that allow for additional storage through MicroSD card. Some players have video playing capabilities and can allow you to access online games and apps. This 16GB player has a slightly bigger screen than traditional MP3 players – 4-inch screen. It has an ultra-thin design of 6mm and works with IPS technology. Apart from downloading music and videos, apps and games, you can also access Facebook, Facetime, iMessage, and Siri. Its 32GB or 64GB version comes with a 5 megapixel back camera that can also record video in 1080p HD videos. The front camera is capable of storing 1.2-megapixel photos and can record up to 720p. This is suitable for anyone who is not interested in cellular connection. It has a fast processor, with well-built app selections. Impressive performance with inbuilt camera. Bigger screen than most MP3 players – 4-inch. It is not an audiophile music player. It can be redundant if you already have a smartphone or tablet. Its battery doesn’t last long. FiiO X3-II is one of its kind music player. You can pair it up with a quality headphones and amplifier will make a difference. Comes with Digital Audio Converter capability and it’s simple to use. If you are an audiophile, then is it is worth every penny you will spend on it. It has no inbuilt memory and it uses a MicroSD card. Its updated design has an all-metal chassis with an attractive appeal. With a USB 2.0 or USB 3.0, you can easily plug this player into your computer. It has a cool user interface too with a high quality 2-inch screen. It is easy to access the MicroSD slot. Has a digital output and has excellent build quality on the device. The package comes with a native DSD support. Very small screen thus limiting displays. Poor performance if you have WAV files. Its interface is not the best. It tends to be a little bit slow. iPod Classic is an iconic hard-drive based player with fashionable appeal. This music player comes with 160GB storage and has a compact size making it easy to carry around. It has an impressive battery life – can last up to 36 hours for audio playback and up to 6 hours of video playback. Its sleek anodized aluminum design gives it an impressive look. The player also comes in two cool colors i.e. black and silver. It has several other cool features like being able to rent some movie directly from iTunes and a 2.5-inch display. Using the Genius feature you can easily find a song or create some mix for you. Has a longer battery life. It has easy to use interface and a solid, understated design. Generous storage space – can carry up to 40,000 songs at a go and 200 hours of video. Its plastic screen might be delicate and susceptible to scratches. Limited in terms of moving media on and off the devices – only through iTunes. Apart from iPod, Sony’s Walkman brand played a major role in revolutionizing the MP3 player market. With Hi-Res audio performance, Walkman NWZA17SLV is much better than the previous Walkman versions. It has impressive features and better audio quality. It comes at a higher price point but definitely worth it. Since it is not a touch device, you navigate around using the diamond rocker and the main control button. The player has 64GB storage capacity and has a slim design. It also has microSD slot that can hold up a memory of up to 192GB. With a Bluetooth or NFC connection, you can easily stream music in many formats WAV, ALAC, AIFF, FLAG, among others. It has an excellent sound quality. It’s slim in design and lightweight thus easy to work around with. Support new 200GB Micro-SDXC storage cards. It cannot play WMA losses files. To make playlists, you have to use Sony’s Bookmarks function. Lacks the build quality that other devices have. True to its name it is, the iPod Nano weighs only 31g and 5.4mm thick so it can just fit anywhere. Since its first release in 2013, Apple hasn’t revised the design of its iPod Nanos. It comes in a variety of colors: silver, gold, blue, pink, gray, and red. Its 2.5-inch screen is multi-touch and comes with obligatory Bluetooth that allows you to use wireless headphones. This media player allows you to flick through two menu screens at the same time. Using Apple’s Genius, you can easily sort your music by playlists, albums, artists, song or genre. Its tactile buttons let you to easily control your music – playback, pause, volume adjusting etc. Sleek aluminum design that is durable. Has inbuilt rechargeable lithium-ion battery with a longer battery life. Has an FM radio and can help you with workout using inbuilt Nike+ support. You cannot use a Wi-Fi; you have to use USB to sync music from PC. It has low resolutions screen. Doesn’t work with Apple Music subscriptions mainly relying on iTunes. 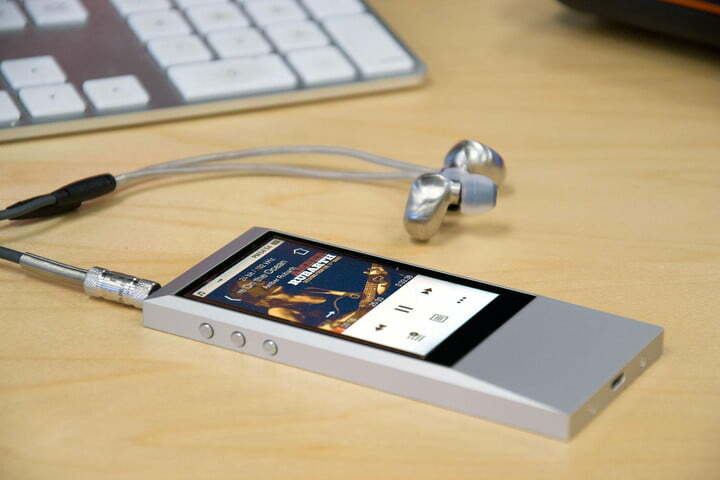 To all music lovers, at least you have a better idea about the best MP3 player for you. The above media players were selected based on quality and functionalities. Some of the relatively cheap devices don’t not have same capabilities as the expensive ones. They might not have a significant difference in quality, though. Hope you will choose the right player to continue enjoying your music.